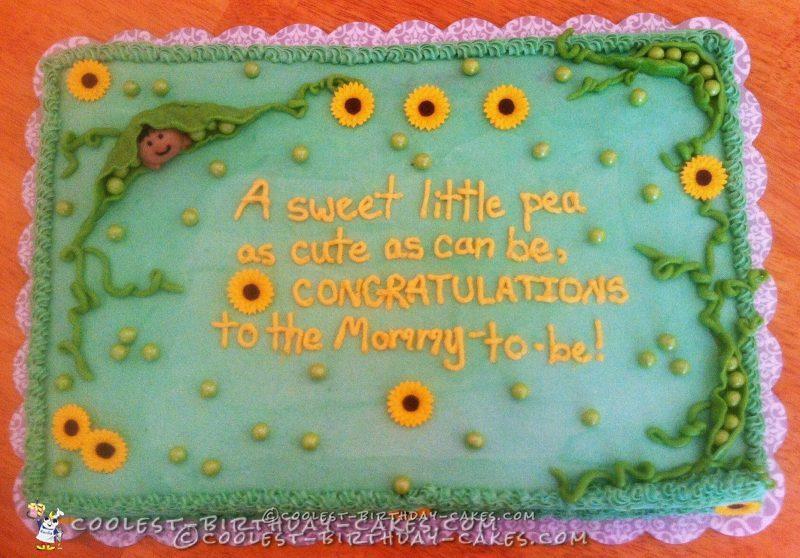 To make this sweet pea baby shower cake, I started with an idea and a rectangular baking pan. I used a basic chocolate-fudge cake recipe and covered it with buttercream frosting. I spent all night frosting the cake perfectly, smoothing out any wrinkles with Viva paper towels. They are cheap and there’s no design to mess with your desired flat cake *canvas*. I used green Tootsie Rolls to shape the shell of the pea pods. I microwaved a mixture of regular Tootsie Rolls and vanilla Tootsie Rolls at 15 seconds to form the baby’s head and arms and then inserted them in the upper left pea pod. I used a paint brush and Wilton’s food coloring to draw on the face. The peas were purchased at Walmart. They are actually shiny green Sixlets (round candy-coated, chocolate-flavored candy) that are sold in the cake section. 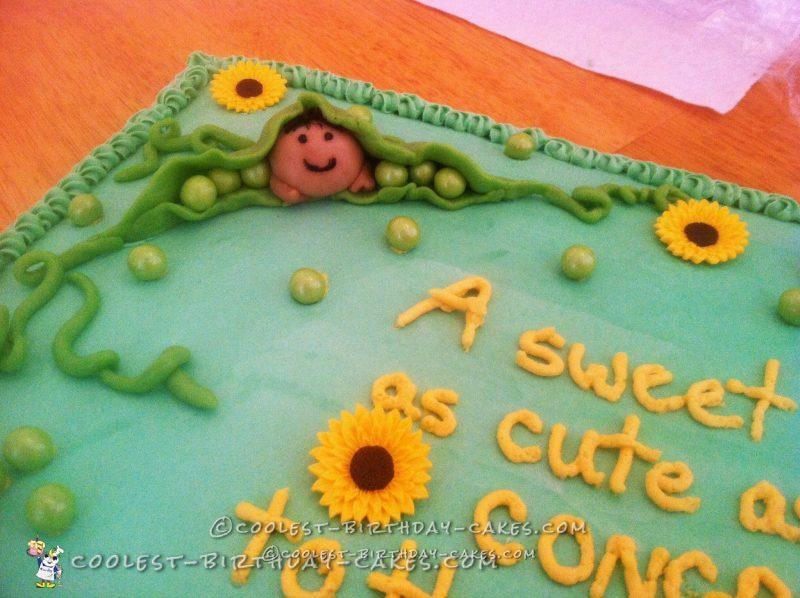 I made the vines that embellish the outer edges of the top of the cake from the same green Tootsie Rolls I used to make the pea pods. 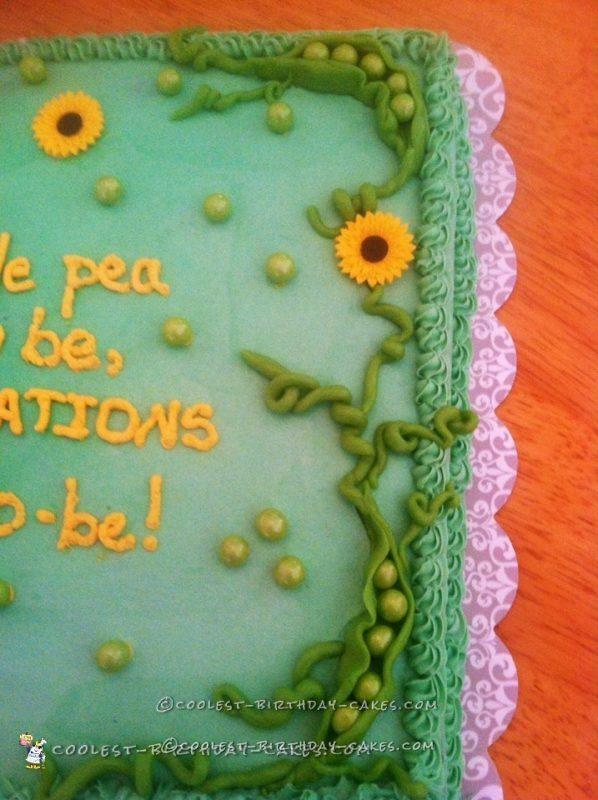 The sunflowers were purchased premade at Walmart and I wrote the congratulations lettering in the same color as the sunflowers to make it pop. The trim was added with a simple star tip swirled for the border.